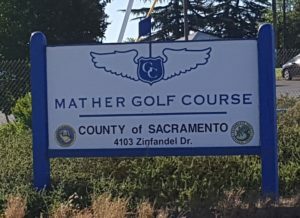 The Sacramento WAGA tournament was host to a small group of golfers for two days June 23,24 at Mather Golf Course near Sacramento. Invitations were sent to our members, local groups of veterans, and others. 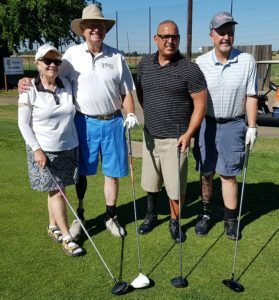 Just 9 amputees participated, along with some local veterans. The weekend was very hot weather, fortunately we got started each day at 9am. Saturday play was a very enjoyable “shamble”. Use the best drive of the four, and play your ball from there. Then play your own game into the hole. Team play was best two net scores. Using this format speeded up play, and produced lower scores. The groups finished in under 4 hours 30 minutes. 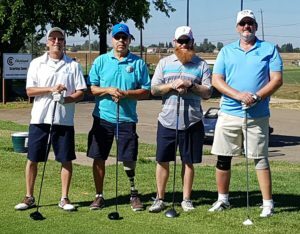 The team of Ray Pursley, Jerry Bradbury, (both veterans) and Eric Johnson (veteran and amputee) along with fellow amputee John Loya won at 111. 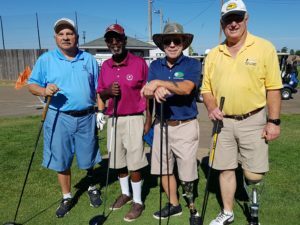 Sunday was straight stroke play, net scores. Chris Wicks won Low Net Champion at 14 under par. He is playing on a new prosthesis. 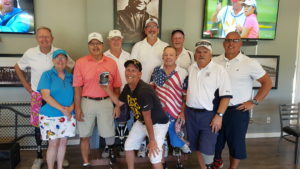 John Loya won second place at 9 under par. We also featured a closest to the hole each day.